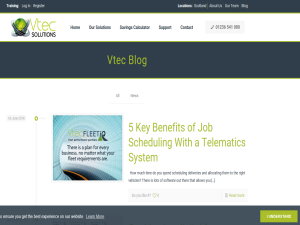 Vtec Solutions, based in Scotland, are pioneers of fleet management and fleet efficiency. They are the UK’s leading suppliers of TomTom Telematics. This blog has industry relevant news and helpful articles. This what your Vehicle and Fleet Tracking Blog Blog Ad will look like to visitors! Of course you will want to use keywords and ad targeting to get the most out of your ad campaign! So purchase an ad space today before there all gone! Our customers tell us that fuel costs are their second largest expense, with vehicle depreciation coming in first place. When you make savings across a fleet, even a small change can make a significant difference. Here are our seven fuel saving tips for your fleet. A telematics system allows you to gather information about where your vehicles are and how they are being driven out on the road. You can also gather data to show you where fuel is potentially being wasted. Your transport manager then has the information they need to make changes and help everything run more efficiently. Unexpected vehicle downtime can be a real inconvenience. Deliveries or other appointments may need to be rearranged at short notice and that may have wider implications for your customers and other business relationships. Carrying out regular checks on tyres, oil, lights and brakes, to name just a few, can help to prevent unexpected delays. There’s also the fact that when your vehicles are in good working order, they’re more fuel efficient too. Fuel prices can vary widely depending on where you are in the country. If your drivers need to refuel at a motorway service station you’ll also be paying a premium. It may help if you provide your drivers with a preferred supplier list. Using telematics can also help as many integrate with fuel cards. This can allow your driver to receive live information about which service station to choose whilst they’re out on the road. Driving sensibly may not be that exciting, but it’s great news for fuel economy. Your telematics system can help you to monitor how a vehicle is being driven and identify any behaviour which affects fuel consumption. Speeding and harsh braking use more fuel and also increases wear and tear which has a wider impact on fuel economy. By focusing on the issues you’ll be able to tailor your driver training to improve overall fuel efficiency. Whilst telematics will help you to devise optimised routes that will help you to make savings on fuel, your drivers are still the experts out on the road. It’s important to balance their knowledge with the data you can gather from your telematics system. Getting regular feedback from your drivers helps them to feel part of the business and can increase their productivity overall. The introduction of a telematics system can be a significant change and drivers are much more likely to adopt the new procedures if they feel their views are valued. In particular, features which allow you and the driver to monitor traffic and avoid getting stuck have a direct benefit to the driver. Of course, avoiding a jam also helps to save fuel. If you’re making a delivery you’ll always need to use a vehicle of some sort. However, it’s worth looking at using alternative technologies in other areas of the fleet. Encourage your staff to think about whether they need to meet in person, or whether they can still have face to face contact using digital conferencing. This won’t always be a practical solution, however could make a difference over time. If you want to improve fuel efficiency and improve standards you need to get your employees on board. They might not all be motivated to help you save money, however environmental concerns can be a powerful motivator. If your telematics data has revealed problem areas in how your vehicles are driven, highlighting the environmental impact could help you to make changes. To find out more about how telematics can help you to save money on fuel, get in touch. The post Seven fuel saving tips for business fleets appeared first on Vtec Solutions. Fleet operation is heavily regulated and we know how time consuming compliance can be. Research has shown that around 13% of UK operators spend up to […] The post Compliance: Are your telematics helping you? appeared first on Vtec Solutions. Fleet operation is heavily regulated and we know how time consuming compliance can be. Research has shown that around 13% of UK operators spend up to three hours each day downloading working hours compliance data. It doesn’t help when the data you need to gather is held across different departments. However, integrated telematics could help you to make the whole process easier. Are your telematics helping you with compliance? Here’s how they can. When your data is spread across more than one department, it can have a real impact on your drivers. When you can monitor everything centrally it doesn’t just make compliance reports simpler, it makes job allocation easier too. Realistic work schedules reduce stress and make drivers’ jobs easier. This approach also reduces the likelihood of costly mistakes on the road, including accidents or even fines for dangerous driving. You can ultimately create a culture where safe driving is your top priority. By monitoring performance data you can intervene early when problems arise. That means that you can spend less time talking to the insurers or even the HSE. Whilst your drivers may not initially like the idea of being monitored, it means that you can provide them with long term support, not just when things go wrong. Monitoring your drivers doesn’t just help to create a safety culture. It can also help you to identify what training is required. Whilst some training is mandatory, you can also offer additional training to address any common problems. Whilst we hope that you don’t have to deal with many corporate manslaughter investigations, telematics can help here too. Clear and easily available training information will demonstrate that you take your legal responsibilities seriously and make efforts to comply. That can help your defence and possibly reduce any penalty you may face. Of course, the most important consideration is that you’ve taken steps to keep your employees and the general public safe. Regular vehicle inspections are a key part of any good risk strategy but they can be time consuming. Telematics can help to identify problems with vehicles as they arise. This doesn’t just help to prevent breakdowns. It can also assist your compliance managers in dealing with potential breaches, even whilst a vehicle is out on the road. Best of all, it can all be done electronically, meaning that you don’t have a long paper trail to follow when you need to find information. Of course, compliance doesn’t stop with the vehicles. You have a duty to ensure that your drivers are fit to work as well. Telematics enable you to monitor performance and pick up on any potential risks. You can also hold information about driver’s health centrally. That means that when you’re allocating tasks any driver specific health risks can be taken into account automatically. Using a mobile phone whilst driving has been illegal for 15 years. However, there are times when you need to communicate with your drivers when they’re out on the road. Telematics terminals can eliminate the need for mobile phone use as you can send instructions to your drivers directly to the vehicle. You can use the devices to send behavioural targets to your drivers and get performance feedback. They’re also useful for keeping customers updated about driver location and any potential delays. In short, telematics help you to make compliance easier and enable better decision making. To find out more about how telematics can help you with compliance, get in touch. The post Compliance: Are your telematics helping you? appeared first on Vtec Solutions. You’ve probably heard a lot about cloud technology already. If you think it sounds like some technological nightmare where your data floats around somewhere in the ether, we understand. This is a relatively new technology but it’s developing faster than most people realise. The applications that are available now cover a wide range of different industries. Fleet management is no exception. You can now use cloud technology to manage a fleet of vehicles and their drivers in a fast and efficient way. Download our full WTF*! guide now, to really get to grips with getting the best return from your investment in telematics. How can the cloud benefit me? It’s a reasonable question. You’ve no doubt heard of the cloud as a way to store information away from your own systems. It doesn’t take up space on your company hard drives so you can hold more data. So what? You might be thinking that you’ve never had a problem with running out of storage space, so how will the cloud contribute to anything? Good question. The truth is that storing your data in the cloud doesn’t just free up your own data storage systems. It makes them more secure too. Want to know more? Download the free comprehensive guide now. We know it sounds illogical. How can sending your data out into a cloud possibly be more secure? After all, clouds release rain easily enough. The difference with this cloud is that it isn’t connected to anything physical. That makes it more difficult to hack, unlike your existing hard wired systems. The cloud has been developed with top of the range security systems that get your data off site and properly protected. That means you won’t have to contact your customers to tell them someone’s misused their data and it’s all your fault. How often do you need to share information? Even if you have data that only relates to fleet matters that could still need to be shared with a few different people and across systems. If you collect anything that relates to finance or HR how is that shared? Do you want to spend your time emailing information across the company or do you have better things to do? When your data is in the cloud you can grant access to anyone who needs it at the click of a button and get on with your day. Instant data access via the cloud doesn’t just mean easier sharing. It means that you can access information from your vehicles whenever and wherever you need it. If you need to know how many hours your drivers have done this week so that you can plan your rota, you can access the information whilst they’re still on the road. No more frantic planning when everyone has returned to the depot at the end of the day. Some of your competitors may already be using these technologies. Your competitors may already be using digitisation and automations to reduce their costs and improve their customer service. You might think that your existing systems are good enough, but good enough is no longer sufficient! In an era of exponential technology growth are you driving change or being driven by change? We now live in a world where everything can be connected and intelligent and we think it should be. Download the free guide now and check out the other pages for information on the vast areas where telematics may be failing in your business. The post WTF*! – Let The Cloud Take The Slack appeared first on Vtec Solutions. Risk Register If the last blog made you cover your eyes or head towards a stiff drink, relax. This bit is much less frightening. In fact, […] The post WTF! * – Risk Register appeared first on Vtec Solutions. If the last blog made you cover your eyes or head towards a stiff drink, relax. This bit is much less frightening. In fact, we’re here to tell you how we work with data to help you come up with a strategy, reduce your risk and potentially lower your insurance premiums too. Check out your personalised risk register now. Part of the FLEETiQ process at Vtec Solutions is to identify areas that are a weakness in each business. This is initially done by creating a Risk Register as shown below which highlights the areas which need immediate attention. The last risk above is “Insufficient engagement from significant stakeholders” which completely changes if meaningful data can be provided to achieve set objectives. Once you get people on board with your business objectives you can start to engage your stakeholders with what that means for them. We know that finding your way around your telematics is a steep learning curve. When you first invest it can feel as if your new system is the answer to all of your challenges, but that isn’t always the case. Learning to make it work for your business means identifying the areas where it can be most effective and lead to lasting change. You might have read this guide and wondered where on earth you need to start. That’s why we devised the risk register. It allows us to be a second, more specialist pair of eyes on your business and fleet management. We can help you to devise a road map that helps you to improve efficiency. The risk register also highlights issues that you can deal with straight away. That can help you to improve safety but also see the benefits immediately. Contact us today to let us talk you through the risk register and where can you can make immediate changes. The post WTF! * – Risk Register appeared first on Vtec Solutions. You are unaware of Director Responsibilities Forgive us, this one could get scary if you’re not prepared. Are you aware of the guidelines for health & […] The post WTF! * – Personal Liability appeared first on Vtec Solutions. Forgive us, this one could get scary if you’re not prepared. Are you aware of the guidelines for health & safety offences and corporate manslaughter cases? No? Brace yourself. You might think that you know all about health and safety legislation. After all, it’s been around for a good few years now. However, the Corporate Manslaughter and Corporate Homicide Act has been in force since April 2008 and it’s scary how many directors remain blissfully unaware of what it means for their business. The Act doesn’t add anything to existing health and safety law, but it changes the way that evidence is looked at if you’re prosecuted for a health and safety offence which has resulted in a death. If the Court believes that you don’t take health and safety seriously you could find yourself in serious trouble. Are you part of a culture that promotes safety or do you push it aside to get the job done more quickly? Whilst the corporate manslaughter laws don’t allow for individuals to be prosecuted, gross negligence manslaughter laws do. That could land you in prison. The Courts are taking a prescriptive approach – they’re not interested in excuses. The criteria for establishing the scale of ‘fault’ is stricter & better defined – a corporate manslaughter charge can result from any health and safety breach that causes a death. Upper limits of fines dramatically increased – fines are now unlimited. Scale of fines directly linked to turnover and they’re meant to hurt. Custodial sentences more likely & more severe in gross negligence manslaughter cases. The Court can order you to publicise the conviction. Imagine telling your customers that your health and safety breaches killed someone. There are also aggravating factors that could increase the penalties. These can be anything from a failure to adopt recognised industry standards to signs that you were made aware of a potential problem. If you’re putting profit before safety you could find yourself in very serious trouble. So far the fines have ranged from £10,000 up to £4 million. Individuals have faced fines of 50% of their weekly salary right up to 18 months in prison. What does this have to do with telematics? Your telematics can act as your early warning system. A judge won’t want to hear that you had telematics but didn’t spot a potentially fatal problem because you weren’t using it properly. Your data can tell you when your vehicles are being driven dangerously. You can change routes to help your drivers avoid getting angry and frustrated because they’re stuck in a traffic jam. It can even help you to identify drivers who might be struggling. When you manage a fleet you’re sending potentially lethal weapons out on the road every day. When the stakes are that high, don’t you think it’s time you paid attention to the data? The post WTF! * – Personal Liability appeared first on Vtec Solutions. Have you been paying attention so far? Don’t worry, there’s not going to be a test. Hopefully you’ll already have learned that good leadership is essential to making telematics work. If you’ve developed a vision for your business and where you want it to go, we’re hoping that you’ve also devised a strategy to make it happen. You have? Excellent. Does it include a comprehensive fleet strategy? What do you mean no? Download your free copy of WTF – Why Telematics Fails today! We’ll forgive you if you’ve been focusing on higher level strategy. If you’re an overworked fleet or transport manager, we understand. However, using your telematics properly will free you from spending all of your time dealing with those day to day tasks. Things like devising routes and transferring the information to your vehicles by cutting and pasting between different systems that won’t talk to each other. You can even download data whilst vehicles are still on the road. The nightmare of scheduling when you don’t know how many hours your drivers have already done can finally come to an end. What does that mean for your strategy? Well, it means that you’ll finally have time to come up with one. We’re sorry if that means you have to go to meetings with the rest of the management team. Actually, you probably do that already, but getting involved in strategy means that they’ll be less pointless. Having a clear strategy means that you can set objectives and decide what data you need to monitor to meet them. Sound good? We thought so. Are vehicles being used to their full capacity? If not, what’s causing the downtime? Start by analysing previous performance and learn to be adaptable to changing circumstances. Fleet telematics can help you to optimise your routes, improving efficiency in expenses and improving the customer experience. Telematics offers a wealth of features that help you to automate your daily tasks – are they being used fully? Digitised data means more secure data storage and less lost paperwork. Are your systems fully integrated? Your telematics could be communicating with accounts, purchasing and stock management to name just a few. Looking at each of these areas and how your telematics can improve performance and make your business more streamlined and competitive. In tough economic times that could help you to spend less and achieve more. Your telematics system won’t have been a waste of money if it helps your business to weather the storm. Download your free copy of WTF – Why Telematics Fails, to find out what else you might need to change to make your telematics work for your business, or contact us to arrange a free no obligation consultation. The post WTF! * – Strategy – Do you have one? appeared first on Vtec Solutions. If you are the owner of Vehicle and Fleet Tracking Blog, or someone who enjoys this blog why not upgrade it to a Featured Listing or Permanent Listing?